The A18 is an amplifier of a remarkable concept in that it combines class A operation with a minimalist signal path and a complete lack of loop feedback in the pass band. Hawk's philosophy is that properly designed simple and few gain stages yield transparency, and that these stages do not need feedback to get distortion below 0.1% or so (but they do need class A, or enriched class AB for that). A similar, if somewhat more extreme, style can be found with Nelson Pass' Zen designs of single-ended MOSFET amps, and Jean Hiraga's Le Class A and Le Monstre. However, the Zens lack voltage gain and are hugely inefficient, making them somewhat confined to a niche even smaller than that of the SET. The Hiraga designs are extremely simple too, but they use loop feedback, and rely on very very large power supplies, sometimes battery-based. The Hawk A18, on the contrary, is a real-world amplifier for real-world systems. And real-world purses. The specified power output is 20 Watts into 8 Ohms, and 30 W or so into 4 Ohms. The A18 is unconditionally stable, even without output inductor, and as such drives electrostatics with ease. 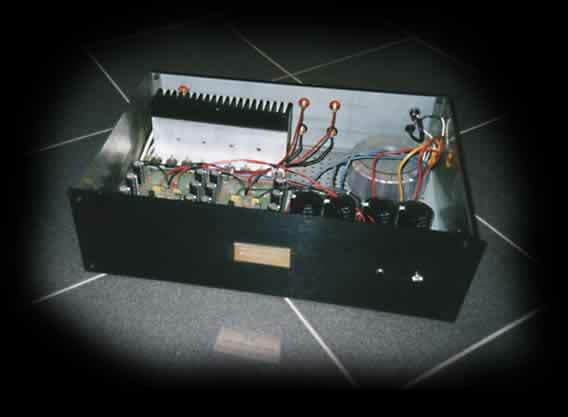 The amplifier has two modes of operation, named class AB and class A. In 'AB' mode, it runs lukewarm to the touch, and offers class A operation up to 0.6W. In 'class A' mode, it gets hotter - but not that hot - and yields 10 W in class A. OK, so it is not a true always-A powerhouse like the legendary Mark Levinson ML-2 (Mark seems to be into even hotter business these days), but 10 Watts of unsullied juice still means a lot in the right system. And the odd excursion into the A18's class B region will go mostly unnoticed, methinks. Take a look at the schematic and admire the simplicity. A cunningly intertwined bias generator (the four current source transistors to the left) and first gain stage make for a stable operating point and a handy input for the DC-servo. After this follows another gain stage and then four power MOSFETs as voltage followers. The power supply from the transformer secondaries on is dual-mono, with extensive filtering: this care for power is a Hawk trademark. The DC servo itself has additional output filtering, for the simple reason, that otherwise it would constitute a source of bad noises straight at the level of the actual input signal. Many manufacturers don't seem to understand the hidden pitfalls of DC servoing, and often mere capacitor coupling is to be preferred to the complexity and compromise of a servo. But as they go, Hawk's circuit is one of the sounder ones. The components used are of decent industrial quality, with the few capacitors in the signal path being Wima polypropylene and polycarbonate. Given the simple circuit tweakers may want to substitute tantalum resistors in the gain stages, and perhaps polypropylene capacitors around the DC servo. 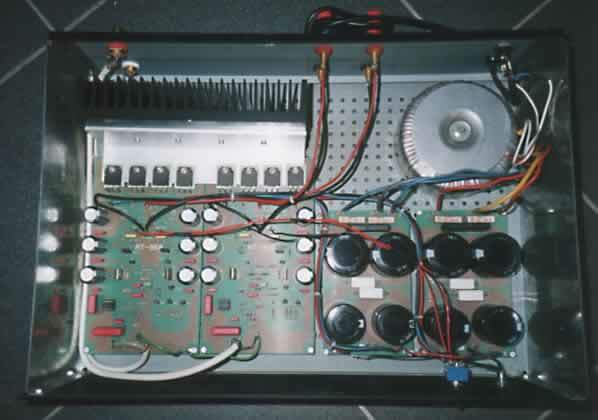 But again, what's in the kit is good stuff, and anyway, both van der Sluis and me are of the opinion that good circuit design always will prevail, fancy label componentry only ever being the icing on the cake. Assembling the kit should not be too hard, provided you know how to solder. If you go for the full option version, then all bits and pieces are included, the only 'hard' work left being the sanding of one metal profile. Unpacked, installed. Power. Green light. Class A. Luka Bloom's "Turf" in the drawer. You know, just the guy and his two A-guitars, Judy and Trudy. (Heck, he has been seen with a third guitar lately, named "Esmeralda" or somesuchting.) Chords the way like "I've got six strings and you'll hear all of them." Masses of delay and reverb. On the right system, that is. Like now. The guitar sparklingly alive. The ambience cavernous. Mr.Bloom's voice warm, and almost tangibly in front of the speakers. No edges. The guitar notes the right balance between wood and string. And this after a couple of minutes only. Compared to this the similarly-priced LFD PA0 sounded a bit monochromatic and lifeless. Christa coming in from the kitchen (actually the same space: our ground floor is a huge U with the speakers on top of the left leg, and appliances on top of the right one). "Sure sounds good, as heard from over there!". Sits down, listens in. After a while "Good indeed, if you want you can buy this one." "You meaning this ugly lab box???" "Yep, and now shut up and let me listen, OK?" Female voices, then. Often, in loud parts, they tend to sound a bit pinched, as if an amplifier could not entirely cope. Not with the A18. Whether bringing forth Mary Black or the Monteverdi Choir in the Gardiner-conducted Maria Vespers, this amp remained utterly at ease, with not a trace of change in character. It remained as sweet and clear, as tight and full in the bass, and the image remained the wide cavernous San Marco. 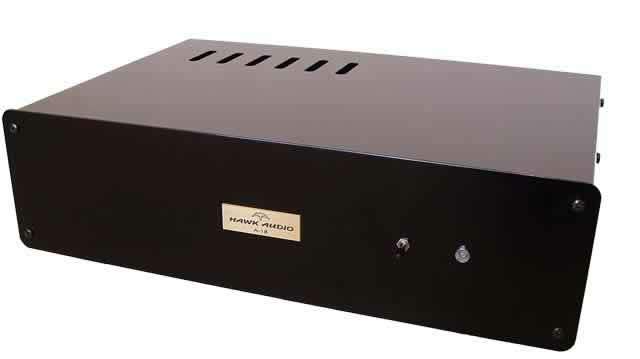 The midrange of this amplifier is wonderfully open, lively, and yet natural, without artifice or false highlight. It is detailed, showing off tonal colour as well as dynamic contrast, and it succeeds in doing this entirely without being clinical or sterile. The bass follows the same trend, too. It strikes a nice balance between full-bodied sound and tightness. As a result, it is both controlled and tuneful. The very deepest bass was perhaps a bit reticent, but apart from that the standard set was several notches above the Quad 306 and the LFD. The treble was initially found to be at least as good as the LFD's: i.e. still a mite transistor-like and white-washed. But I got the feeling that my Argo preamp was the weaker chain of the system, and this warranted further investigation. It was a shame that the Vacuum State FVP5 valve pre had left, but I managed to get hands on an early sample of the Trichord Orca. This made for a good marriage to the A18: the treble now got quite a bit more refined and fluid, the lower registers full and round. As a bonus, stage width and depth got even better, now being fully in yummy territory. Dynamically the A18 was fine. Not superb, just fine, thank you. It is, after all, a small amplifier, and the use of MOSFETs in the output stage can lead to some thermally-induced compression: such is the nature of these devices. But again, what there was is a joy to hear, and when used with matching loudspeakers and in a room not too large, this amplifier will be the source of a lot of fun. Operationally the A18 was a real sweety. No power-on/off plops, no transformer buzzing (you should hear my regular amps! ), and not even a tick to be heard when toggling the A/AB switch. In fact, the A18 proved to be dead-silent, apart from the music. As for that 2x10W class A: it runs hot, but not that hot at all. And since the heatsink is a fair distance from the power supply capacitors, a long service life can be expected. Moreover, in the cool-running AB mode the sound was still 80% of what we got in class A, so this is really an option for background music and home theater use. By now it must be clear that this is a very good amplifier indeed. It offers a fine transparency, married to a tight, detailed and tuneful bass and an expansive, natural and fruity midrange and glare-free treble. This is a music maker that, when used with the right loudspeaker, will bring a grin to everyone's face.